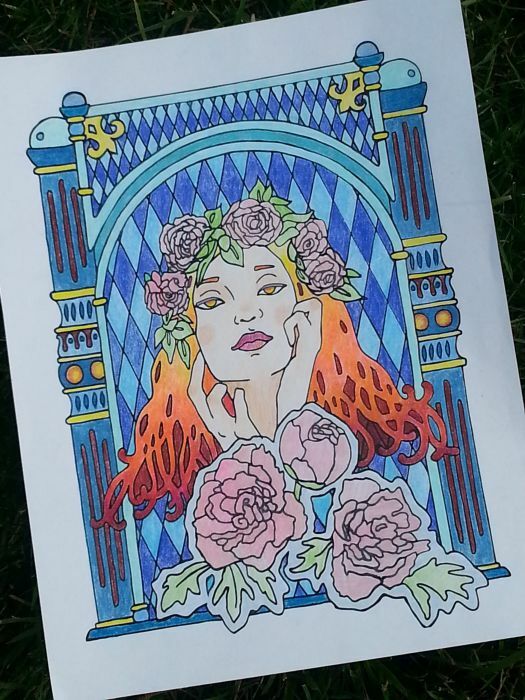 I had been thinking about why this adult coloring craze was so effective at increasing focus. Case in point: I color most often at church. Sure I’m a little embarrassed because it looks like I’m not paying attention, but nothing could be further from the truth! And now that church is in the afternoons, I pull out a page when the eyelids start getting heavy and a good nap is all I can think about. I’ve also found with that focus a calming zen-inducing state can be found. The other day I cajoled a couple of friends to join in coloring with me. Before we knew it, an hour and a half had slipped by unnoticed and one had to rush out because of a tennis match she was late for. 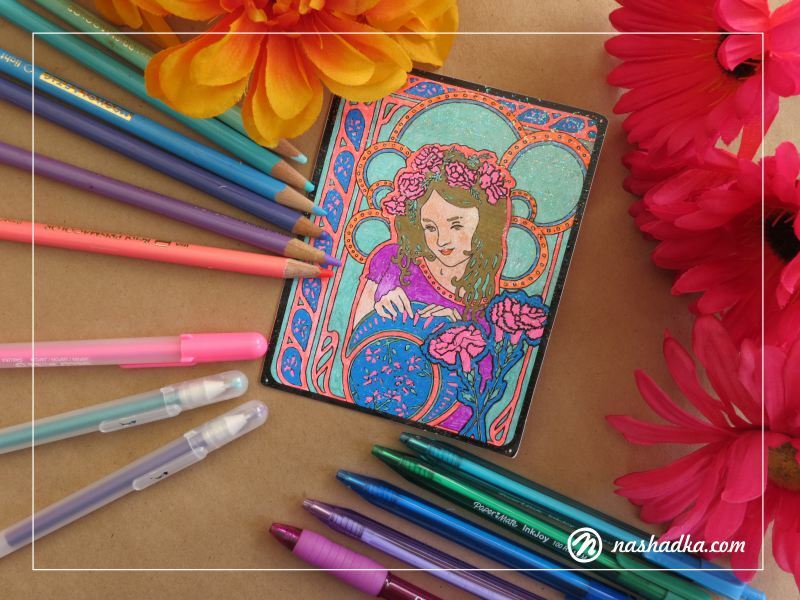 Lesson learned – set an alarm before you start coloring! Alternatively, you could just give up tennis. Yes, I hopped on the coloring bandwagon, but now I have a new problem. Pages are piling up and they’re ending up shoved into drawers (I’m a huge fan of shoving things into drawers). I’m adverse to just tossing all those beautiful pages into the trash. I had thought about several things I could do with them: make wrapping paper (eh), turn them into transfers (maybe someday), wallpaper (just kidding). The solution hit me like an exploding apple (ok, I’m not great with metaphors, but I am juicy). You see I love getting mail – not the piles of straight-to-trash everyday mail – the mail that is handwritten from a friend or family and is special because it’s so rare. I’m usually so excited about personal mail that I’m tearing into it before I even get back into the house. 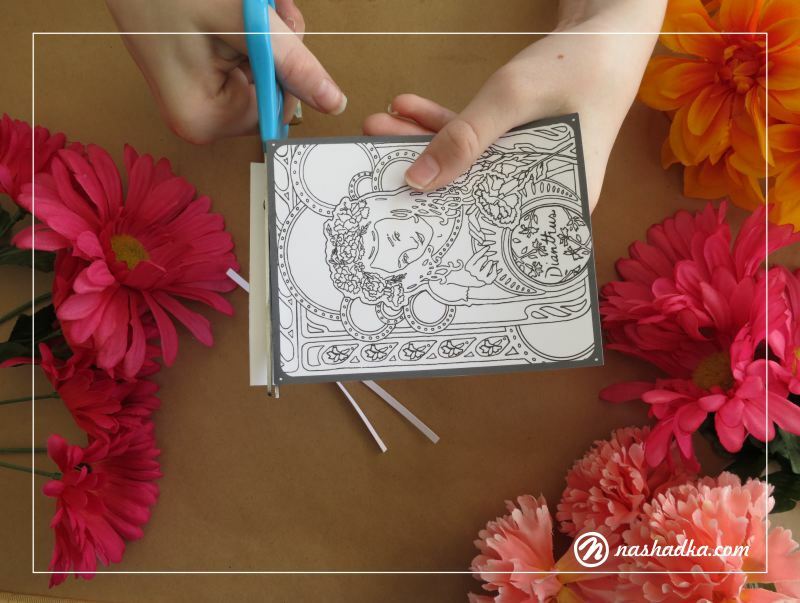 Why not convert those coloring pages into postcards?! They’re super simple to make. They’re cheaper than a letter to mail. And your friends and family are going to love receiving them. Even if your family is illiterate, they will love the pictures. They’re so easy a kid can do it (that’s why my demonstrator today is a reluctant 12-year-old). Now if you’re at all interesting in starting with the end in mind, I’ve created some printable postcard designs available on Etsy. Make sure to print on cardstock or postcard paper (which is just expensive cardstock that they perforated for you). Any office supply place will have it. I just happened to have some postcard paper on hand but not a stitch of cardstock – I can’t fathom how that happened. The postcard paper had been shoved in a drawer and has been collecting dust for at least a decade, along with old socks, an MCI phone bill, a BlackBerry, and probably my missing retainer from 2013. As long as it is as thick as an index card it should be okay – or so they say. I’ll be honest, an index card feels pretty wimpy. My solution just to be safe: glue two pages together with one of them being cardstock. If you’re like me and you get glue in places you didn’t think possible, I have the glue for you. Rubber cement is perfect because when it dries you can easily peel/roll it off areas you don’t want it. Plus it comes with its own little applicator brush. And when used properly, it’s strong enough that your postcard won’t come apart in the post office machines. The secret is to apply it to both surfaces to be glued and stick them together while still wet. Even if you mess up while positioning, you’ll still have a bit of time to slide them into place. Afterward, press the two sheets with a fancy brayer . . . like your hand. I don’t have a brayer and have never felt like I needed one, but I hear they’re full of sweet rolly goodness. I rarely get things perfectly lined up when I glue so I always allow for some excess that can be trimmed off. If it’s not perfect after this, I just call it “artistic license”. Now if you’re using a page you’ve already colored, great! Reduce, reuse, recycle! But if you’re interested in some free designs, subscribe to my awesome and completely free resource library. New designs are released every month including coloring pages, bookmarks, and postcard templates! This is by far the most important step (other than putting a stamp on it). Anyone familiar with the mail process knows it’s not gentle (even when you clearly mark them “do not bend” or “fragile” -but that’s another story). So you’re going to want to put a protective coat over your design. Any crafter worth her salt is going to have mod podge ready for such projects. I happen to have three on hand, but only one that hadn’t hardened to an unopenable rock. Thank goodness it was the sparkly mod podge. I think I bought it by accident, but it’s one gorgeous accident for this project. Only mod podge the colored side. The other side needs to be clean for writing, or so I’ve heard. *Someone said that modpodge can smear the pen, but I didn’t have any problems whatsoever. Make your creation look like a postcard by drawing one line vertically down the middle and three horizontally to the right. This is easy and doesn’t require any special measuring except taking care to leave room for the stamp (which I of course forgot to do on my first try). Thanks for joining me and I can’t wait to see what you come up with! 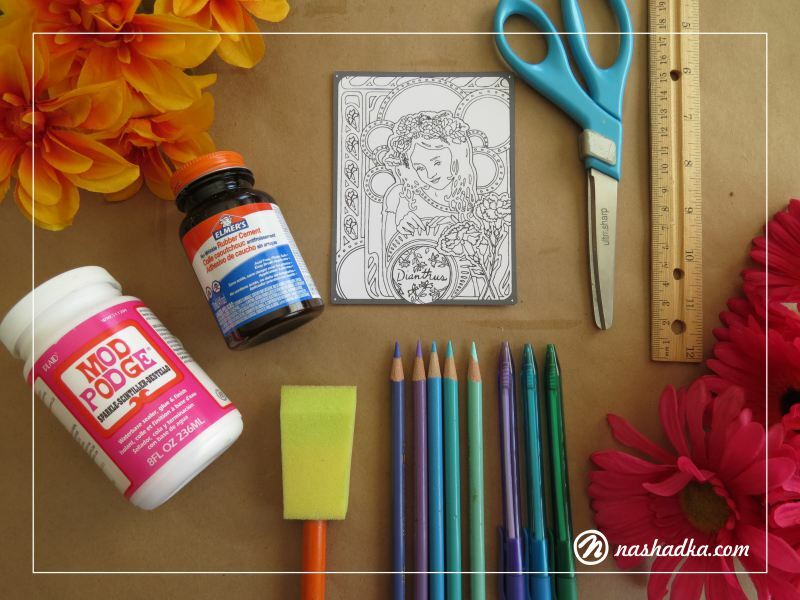 All of my coloring pages are drawn by hand in a number of steps. Here’s what normally happens. The beginning starts out quite simple. It starts with a girl. Any ol’ girl will do. Then I choose a flower that catches my fancy. Any ol’ flower will do. What I know for sure is that I need to turn those flowers into a crown and place an up close view of the flower in front. I get each element sized about right and then I place them together using tracing paper. Getting just two elements in place is easy. Next, is the tricky part (or, more accurately, the most time-consuming part). I have to play with shapes and designs for a pleasing look. I prefer a design that is not is too fiddly and I’d like it to have a nice sense of balance. There is no trick or formula for finding balance; it’s really just a lot of experimenting. I begin on tracing paper. I trace and re-trace. I erase and re-erase. Until something emerges that is pleasing and exciting. Gradually, I’m able to solidify a few of the bits and pieces in ink. This also helps preserve the drawing as unworthy areas are demolished by erasing. Starting to ink in the design. Finally, I find a point where I’m satisfied. Or, at least, a point where I’m running out of time. It would be a poor coloring page I sent you if it stopped at the scan. To get the sleek polished page you receive each month, the scan must be converted into a vector image. 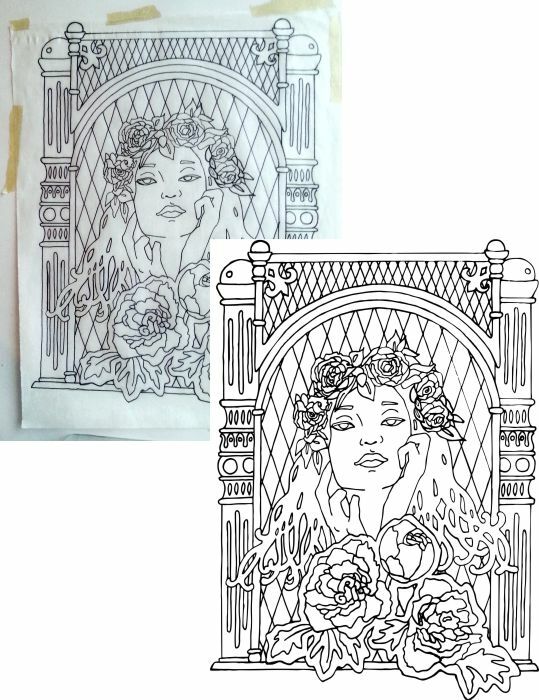 Scanned image compared to the digital recreation. Thankfully, I have a fancy program to do this. Unthankfully, a computer fails miserably at seeing the wonderful design I’ve created. So carefully and painstakingly I must recreate the tiny details that get lost. I also have to clean up any mistakes I’ve made in the drawing process and add elements that may have been left out. The fun part is now to print it out and color it. You may not think this an important step, but a lot of tricky areas and overlooked mistakes are uncovered this way. Plus, it gives me a dazzlingly colorful design to show off. Colored in and ready to show off. I’m finally ready to convert it into a PDF and get it uploaded. That’s pretty much it besides sending it to you. Enjoy! 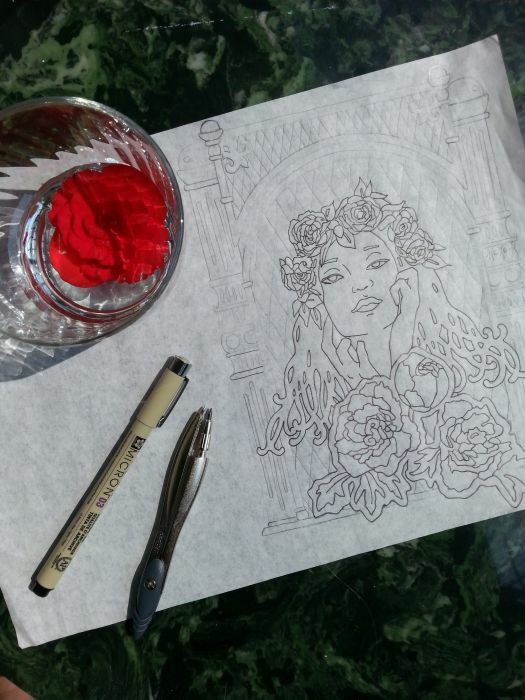 Get your coloring pages with new designs each month! Mood & Environment Are Not Separate! Our environment is a large influence on our mental well-being. So we should surround ourselves with beauty. We’re attracted to it, it brightens our day, and it will make you smile. That’s why in today’s post I brought together a collection of things that should brighten your day. Smiles are contagious. I dare you not to smile along with Alma Garcia in this short 10-minute film by Carlos Lascano. I’m still smiling! How about you? Artists translate the world’s beauty into even better beauty. (Can that be a thing?) Get your fill of positive quotes and images on a post I co-authored over here at Crazy Little Family Adventure. Orana created the images and they are an amazing compliment to the quotes. I think it depends on if you listen to it muted or not. I’d say that without music it will be your moment of zen for the day (it’s kind of trance-inducing). Choose the method that gets you to the mood you need most! So which did you try? Here’s a similar experiment, a blog post I wrote ages ago about the power to influence mood: How to Evoke Powerful Emotion. Its focus is to calm and uplift. It’s worth a look even if you just like looking at the pictures.